Compare, convert between and order fractions, decimals, and percents. 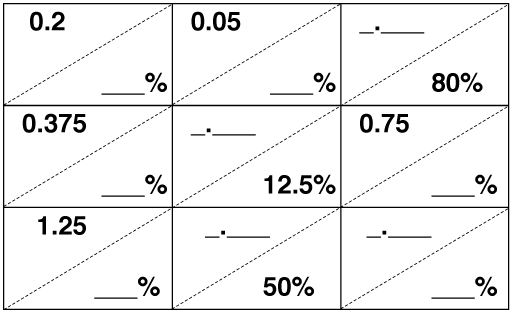 Use area and linear models of fractions, decimals, and percents to understand equivalence. Students work in small groups on a collaborative discussion task, placing decimal/percent, and fraction cards in order, along with area and linear diagrams that assist them in justifying and explaining their thinking. Each student will need a copy of the assessment tasks Fractions, Decimals, and Percents and Fractions, Decimals and, Percents (revisited). Each small group of students will need some plain paper, cut-up copies of all of the Card Sets, some poster paper, and a glue stick. 15 minutes before the lesson, an 80-minute lesson (or two shorter lessons), and 20 minutes in a follow-up lesson (or for homework). Exact timings will depend on the needs of the class.